The NJM2380 is a high precision adjustable Shunt Regulator It is adapted for downsizing power supply modulebattery charger and othersbecause an ultra mini package SOT-23-5(MTP5) is included in the package line-up. 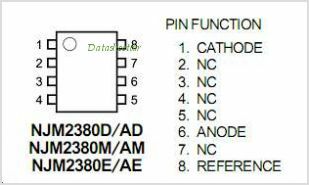 This is one package pinout of NJM2380,If you need more pinouts please download NJM2380's pdf datasheet. NJM2380 circuits will be updated soon..., now you can download the pdf datasheet to check the circuits!